Build your website your way. PushType is a next generation, open source content management system for Ruby on Rails. Designed to be as flexible as you need it to be, PushType lets you build your website your way. Fully flexible - if you can think it, you can make it! Define a structured content tree with collections of pages, blog posts, events, book reviews or whatever your site demands. Model your content just how you need it with PushType's built-in collection of custom field types. If you need more, we've made it simple for you to create your own field types. Upload, store and easily manage any kind of media including images, documents, videos and audio. Various backend storage options are available. Dynamically resize uploaded images whenever you need to. PushType allows you to implement responsive images and advanced creative art direction techniques. The clean and uncluttered admin interface is simple to use and gives website owners the tools they need to manage what matters most - the content - with no distractions. Powered by the greatest web application framework, and backed by the quality Ruby eco-system. PushType knows when to get out of your way and let Rails do the work. 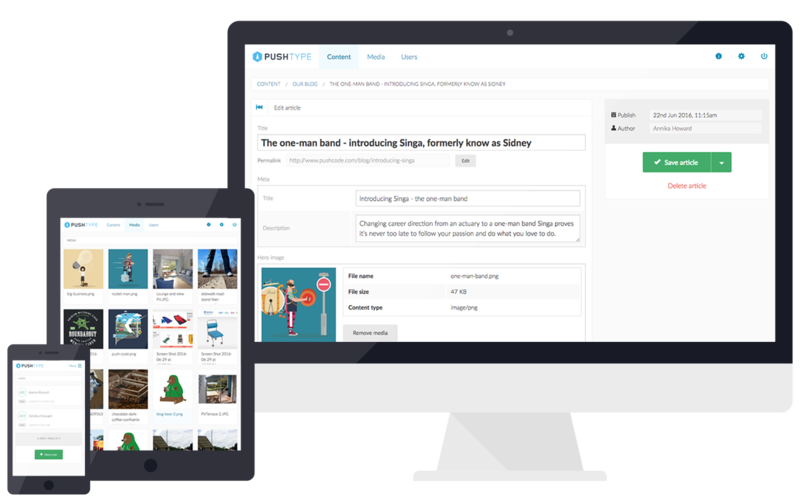 PushType is a modern content management system designed to make the developer's job easier. PushType is a modern content management system for Ruby on Rails. It takes advantage of powerful new features available in the latest versions of Rails and PostgreSQL, delivering a fantastically flexible toolset for developers working on any kind of website. If you care about Ruby, learning and diversity read our manifesto and join the PushType community. PushType puts you, the developer first and every design decision has been made to optimise for programmer happiness. Building websites should be as pain-free as possible. PushType is no black box - you're encouraged to hack, tinker and experiment with code. Everyone benefits from a healthy Ruby eco-system and we want to encourage others to learn Ruby. PushType is licensed under the MIT license. You are free to change, modify and use it as you want. Help us to found our community and shape PushType with your code and ideas. If PushType sounds like the CMS you've been waiting for let's get going! Get started by finding out how to install PushType. Help make PushType work better for you. Join the PushType community. Build on what we've started. Find out about contributing to PushType. The PushType CMS is free software, lovingly developed by Push Code, and released under the MIT license. The content of the PushType website is licensed under the Creative Commons Attribution-ShareAlike License. PushType © 2015-2016 Push Code Limited.